Choose an Award-Winning Subscription Designed by Parents and Educators for Curious Kids. Visit http://www.littlepassports.com/reading for Creative & Fun Ways for Your Kids to Explore the World! Reading with Your Kids Podcast: An Interview with the Reading Rainbow Star & A Beloved Storyteller, Levar Burton!! We have a very special guest for you today! He is an actor and a longtime educational advocate who has had more than 30 years’ experience speaking directly to children about grown-up situations. He is the co-founder, and star of the original “Reading Rainbow” PBS show. Please welcome to the show, Mr. Levar Burton! LeVar’s mission is to create a world where every child becomes a literate, compassionate, critical thinking global citizen. Furthering his commitment to kids and education, Burton announced his decision to expand his content offering and areas of focus through a new venture, LeVar Burton Kids. In our exciting episode, LeVar and Jed will discuss the goals for his recent project, Skybrary Family and Skybrary School services he offers. We also talk about LeVar’s mission of promoting critical thinking and igniting kids curiosity through a broad range of subjects close to his heart. In addition to introducing STEM-based subjects, he intends to explore diversity, equality, and social-emotional topics. LeVar Burton is an actor, director, and educator who has been an icon for more than 35 years. He was the host and producer of the influential television program Reading Rainbow for more than three decades and starred in the TV miniseries Roots and on Star Trek: The Next Generation. He lives in Burbank, California. Susan Schaefer Bernardo is a published poet and the author of Sun Kisses, Moon Hugs. Courtenay Fletcher is a designer and the illustrator of Sun Kisses, Moon Hugs. She lives in Los Angeles. Actor and longtime educational advocate LeVar Burton has had more than 30 years’ experience speaking directly to children about grown-up situations, and The Rhino Who Swallowed a Storm is a story that helps ease the fears and worries of a young childMica Mouse lost her house in a terrible storm, and now she trembles when the weather turns rough. She’s not so different from other children who’ve experienced something very disturbing in their life or heard about tragic or frightening events in the news. Mica’s father tells her the story of a brave blue rhinoceros who learn how to get through rough times with friendship, helpers, love, and by “feeling your feelings.” LeVar Burton has poured a lifetime of experience storytelling to children into The Rhino Who Swallowed a Storm, and the result is more than a book—it’s manual for finding the light in the midst of dark times. Click the Amazon link below for book samples, reviews and to purchase! More about LeVar Burton Kids, a digital platform for elementary school teachers to engage and inspire young readers. How did LeVar become such a passionate advocate for READING? When did LeVar know he wanted to be a writer? Is there anything on the LeVar Burton Kids Skybrary that will help parents who can’t read? LeVar’s Kickstarter campaign that aims at delivering interactive books, teaching guides, and video field trips to 10,000+ classrooms in need. What are the kinds of field trips kids can go on? 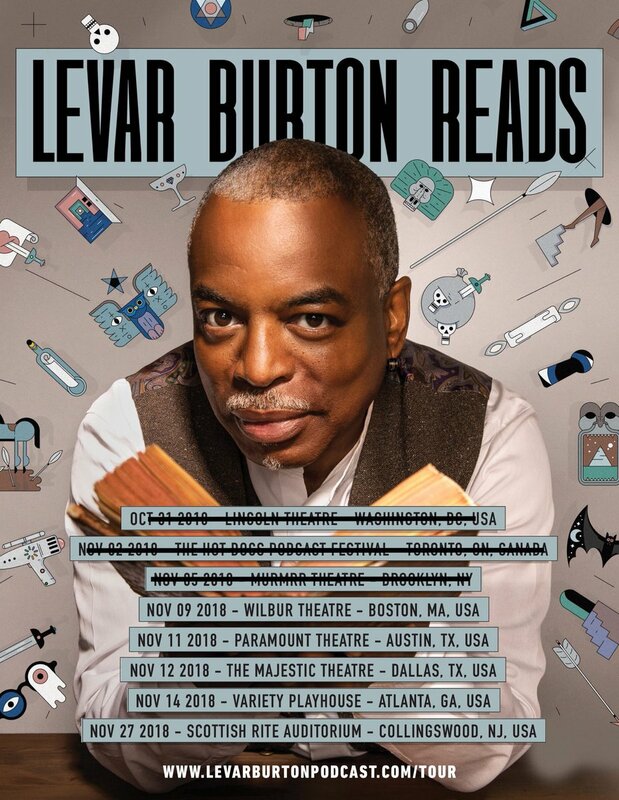 More about LeVar Burton podcast that invites listeners to take a break from your daily life, and dive into a great story. Thank you, LeVar, for joining us and for sharing your wonderful insights with us! PreviouslyIf I Had a Giant Toe by Jill D. Clark: #RWYK Certified Great Read! Read NextThe Shadow’s Servant by Justin Swapp! !